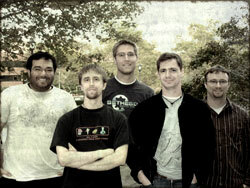 Fallout 3 has been the first Bethesda Game Studios project with a dedicated level design team from the outset. With this resource, we were able to set our sights higher than ever before. We knew early on that one of our big concepts for the game was to challenge the traditional RPG divisions between towns, wilderness, and dungeon. With that mission in mind, we actively sought to blur the lines and create a world that was at once believable, unpredictable, and above all; entertaining. The Washington, D.C. area was a natural choice of setting for the game. Despite her architectural beauty and social significance, the Capital is surprisingly neglected as a setting in videogames. We believed, as locals, that we had a great opportunity to do her justice. This setting has been a blessing in many ways. The U.S. Capital is thick with imagery and symbolism which is only amplified against an apocalyptic backdrop. This is a city of beautifully distinct architecture and a variety of local charms from neighborhood to neighborhood. Those of us who don’t live within D.C. herself are a very short metro trip away from the heart of downtown, so research and inspiration were never far away. For all her grandeur, D.C. also presented us with some design quandaries that we had never encountered before. Early prototypes showed us that simply building a city layout in the open world was not only a performance nightmare, but also prevented us from creating the kinds of gameplay scenarios we were eager to attempt. We also looked at other open world games, like GTA and Crackdown, with expansive, open cities, and those games allow the player to move around the world in a much different way than we felt fit Fallout 3. Players don’t have access to fast cars or superhuman jumping abilities. Rather, explorers visiting the Capital Ruins do so in a thorough and deliberate manner, and we wanted to turn our attention to a density of destruction suitable to a devastated city. To this end, we focused on combining the visual focus of level design in other first-person titles like Doom 3 or Call of Duty 2 with the exploration aspect of games like Beyond Good and Evil or any Zelda title. 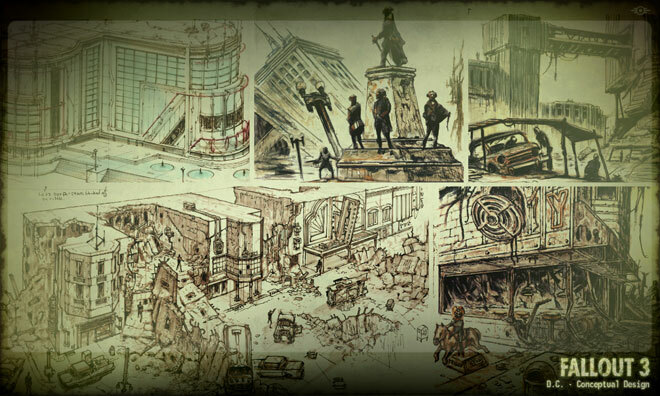 These influences, as well as our own ambitions for the game, helped guide the level design of Fallout 3’s D.C.
Our goal with D.C. was never to rebuild the city street-for-street, but to capture her spirit. The timeline of Fallout diverged from our own many years in the past, and progressed beyond our present day before the apocalypse happened. While much of the cityscape would be recognizable to us, this vision of D.C. is distinctly different from the one we know today. Major and historic landmarks remain. The monuments on the National Mall are present, and a portion of the C&O canal can be visited. Arlington Cemetery reclines west of the Potomac River, beyond the Key Bridge. The city surrounding these major points of interest is generally more dense and oppressive, however. Further, D.C. would have been an obvious priority target in the nuclear exchange of 2077, known only as “The Great War”. The catastrophic damage caused by intercontinental barrage devastated the city, making exploration difficult and dangerous. Much of the city would be cut off from exploration, and navigating the ruins often requires passing through seeming unrelated areas, such as clambering from a collapsed train tunnel into the basement of an office building, and emerging in a city park or bomb crater. So, instead of D.C. being an enormous, open area on the world map, we hatched a plan to focus on the individual areas and neighborhoods of the city. Each of these neighborhoods is its own large outdoor area. This allowed us to clearly define the personality of every neighborhood and specifically tailor gameplay to populate each. Further, the player must navigate treacherous underground areas to move from one neighborhood to another, as many of the surface-level city streets are completely buried under heaped hillocks of debris from shattered structures. The neighborhoods of D.C. are so varied and unique; it was difficult to select which ones to re-imagine. Pennsylvania Avenue and the National Mall were obvious choices, while the historic appeal of Georgetown and Dupont Circle helped those areas make the cut. You can also visit less well-known areas such as the residential crossroads of Seward Square in Southeast D.C., or the modern and efficient Falls Church. Thanks to the inherent character of areas like this, it was easy to draw inspiration to guide our hand. When a level designer was assigned a neighborhood, it was easy to research its history and defining traits. More often than not, our difficulty was not in finding a defining characteristic of a neighborhood, but which of many to focus on. There’s something to be said for actually visiting a place when trying to distill and recreate a bit of its character. 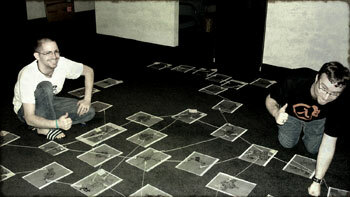 Connectivity became a well-worn part of our vocabulary while working on Fallout 3, particularly when discussing D.C. One of our usual level design concerns is to avoid the player exploring and clearing a level, only to have to backtrack through empty hallways to escape. For D.C., achieving a believable world design involved allowing multiple ways in and out of an area. We created alternate routes that circled back to an exit or, especially downtown, allow the player to pop up in a new location entirely. This elegantly avoided the issue of back-tracking, but made it more difficult to design gameplay to be compelling regardless of the player’s direction through it. The city is laced with dozens of such small and versatile connections. These interior locations became instrumental in the design of D.C. because their multiple entrances allowed us to connect each neighborhood to the others as part of an elaborate network of ruined tunnels and structures. Working out the connectivity of DC's intricate levels. The city is also teeming with locations which are not specifically designed to be connective between neighborhoods. These levels can only be reached by delving ever deeper in exploration of the city ruins, and it’s here that you'll find a number of side quests, throwbacks to classic Fallout lore, and hidden treats. When designing levels for Fallout, it was also important to make sure every space, from these full-fledged dungeons to the smallest shack or train tunnel, was unique in some way. This is in response to one our own criticisms of Oblivion, echoed by many fans of that game, which was the amount of repetition in dungeons. Though we must re-use art assets out of necessity when creating such a large game, we made time for every space to be built and iterated upon by hand by both level designers and artists. Small things, such as avoiding exact duplications of even subtle elements like the arrangement of some trash on a table, can do a lot to avoid repetition and player fatigue. With such a variety of spaces linked together – large, exterior neighborhoods, small connecting tunnels, and full-sized levels to explore - D.C. Is an overwhelming place to visit. To an extent, this is by design. Players are not expected to “complete” D.C. in the sense that one completes a traditional game level. The downtown ruins have no determined beginning or end, and the full scope of the space is initially obscure to the player. Areas had to provide interesting experience arcs regardless of where the player is coming from, or what skills and equipment they have. Such non-linear areas can easily become sprawling and labyrinthine, forcing us to be vigilant and make cuts to keep things cohesive. These and other common level design issues were amplified and required extra attention. More difficult, however, was not just creating good moment-to-moment gameplay in D.C., but tying the whole region into a consistent whole. This exposed perhaps our most daunting design challenge; how do we communicate to the player who has been conditioned to expect to “complete” a level that D.C. is just too big to tackle in a sitting? The game world is filled with tiny cues to try and communicate to the player that they should leave from time to time and return later. Most players realize soon into exploring downtown that the scope of the area is expansive. Character dialogue reinforces that the city is vast and dangerous. Connective areas are generally very short, and share a naming convention to reinforce that they aren't full-length level experiences, while full fledged levels are given names unique and more meaningful – such as the Museum of Technology or the Capitol Building – to hint at the nature of the level within. Expeditions into the heart of the city also tend to be much more trying than encounters in the Wasteland around Vault 101, the player's starting point. Low-level characters can expect to run home licking their wounds if they venture very far into the municipality of post-war D.C. There are also many discoverable map markers in the ruins. Each of these provides a fast travel point to return to as well as a small experience point reward for finding them. These cues serve as a sort of optional checkpoint system, reminding the player that they can take a trip to town, sell loot and rest up, then easily return to this spot to resume scavenging D.C. at a later time. We also filled D.C. with small stories to help build the larger arc of the player’s experience. These stories are side quests from our quest designers, traditional levels with their own secrets to uncover, or one of numerous terminals, notes or recordings. Fallout is a world rife with the unfinished tales of lives cut short by nuclear holocaust, as well as those of unlucky survivors who scrabble out a meager life from such dire circumstances. With such a deep well from which to draw inspiration, time was the only limit on how many tales could be told. D.C. is full of these stories, told through any combination of text, dialogue, or more subtle venues. The written word is a powerful and direct tool for storytelling. Much of our storytelling as level designers, however, is told with the voice of the world. For every space in the game, however minor, we asked ourselves “why is this here” and “what’s happened here?” Even when this back story isn’t conveyed directly to the player, it informs even minor level design decisions and lends an honest quality to the space. A lonely grave, a heap of human gore, or a long-abandoned outpost convey atmosphere and meaning without a single written word. These small stories all contribute to both the truth of setting and the unique narrative of each player’s experience playing Fallout 3. Their distribution through the world is designed to intersperse the player experience with more punctuation marks to keep time playing the game from blending into a hazy, forgettable miasma. We set out to blur the lines with Fallout 3’s level design, and building D.C. was our greatest experiment, entailing every aspect of our craft from the granular to the grand. We hope that, in some small way, it can change the way you look at RPGs and game worlds in general. When you venture past that threshold of safety and plunge into that ruined metropolis for the first time, keep your wits sharp and your eyes open. 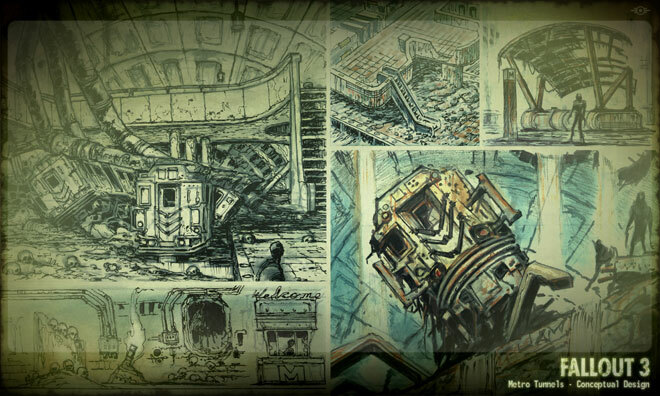 The wasteland may be dangerous, but the ruins are a new experience altogether. Let us know what you think when you emerge, eyes blinking, on the other side.